TelePAC is Back, With a Brand-New Brew Tour! If I could sum up the ICA Golf and Grill Classic I would describe it as THE PERFECT STORM. While this may have a negative connotation with the meaning of The Perfect Storm, I’m going to wrap this all up into positives. Leading up to this event there was a lot of energy, work, and rapid hands pulling this event off. Monday kicked off with an absolute whirlwind of fantasticness (if that’s not a word, it is now!). I met TONS of new people and new faces and the vibes I received from everyone were all extremely positive. Now Monday was HOT and I mean HOT! Thankfully the beginning of The Perfect Storm supplied us with a bit of a breeze. After the golfers had wrapped up their golf game we all headed to the beach to kick back, eat some great food, and awaited for the golf winners from Monday’s play to be announced. Right as the winning team was announced our Perfect Storm came in like a wrecking ball. Torrential downpour. It rained during the BBQ Monday, Monday night and into Tuesday. We were all anxiously staring at our cell phones with the weather apps open to see if The Perfect Storm would let up anytime soon. Unfortunately, The Perfect Storm won, and we got rained out for Tuesday’s golf game. However, The Perfect Storm cooled everyone off from heat exhaustion, it brought everyone together in one place for the ICA Golf and Grill Classic, it allowed me to meet tons of our members (and hopefully you did too), and all-in-all it was a really great event with electricity and excitement throughout. I can’t wait for next year… Maybe without The Perfect Storm though. Now onto the good stuff…. We had nearly 270 Alliance members and friends attend the 5th Annual Golf and Grill Classic this year. Monday welcomed 222 golfers and over 52 sponsors and BBQ Attendees. 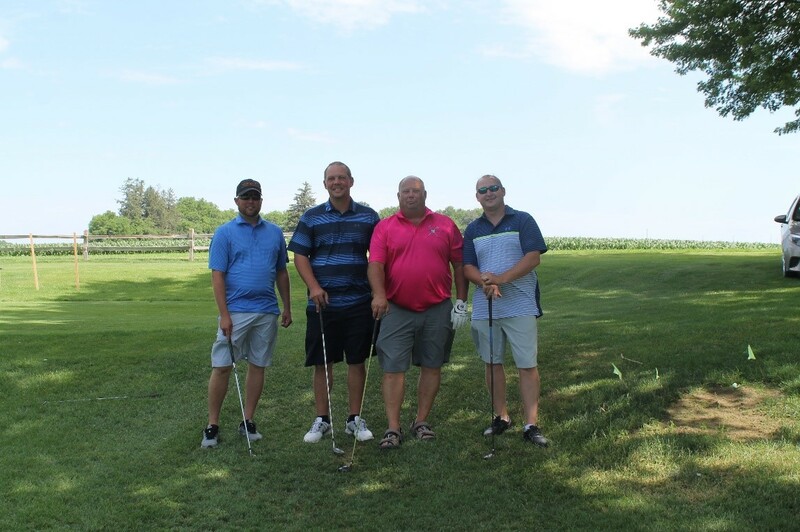 Closest to the Squiggly Line: Chuck Dove, Action Battery Wholesalers, Inc.
A special thank you goes out to the Golf Committee for their time and efforts in planning this event and to John Dinnebier and his staff at Lake Panorama National Golf Course. Randy Yeakel, Communications 1 Network, Inc. Please extend a BIG THANK you to all our sponsors if you see them out on the course. 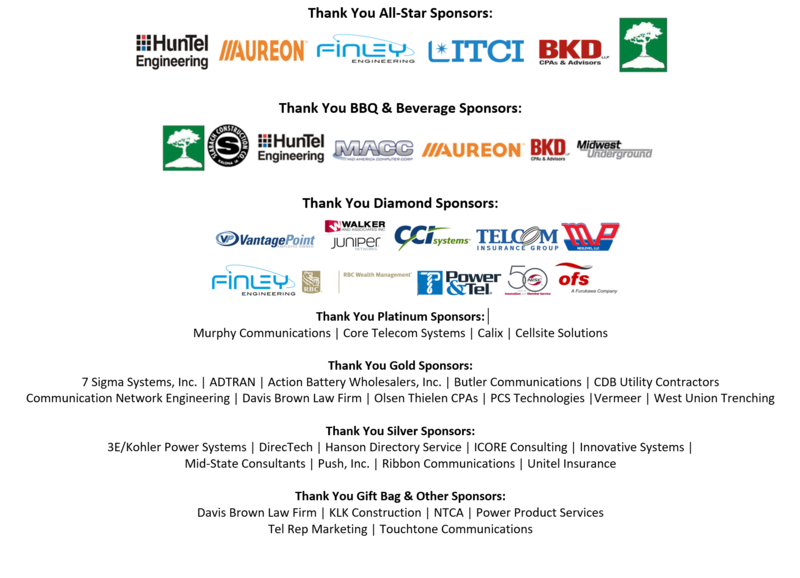 We deeply appreciate their support to make this an outstanding event year after year! We look forward to seeing you at our 5th Annual ICA Golf & Grill Classic! 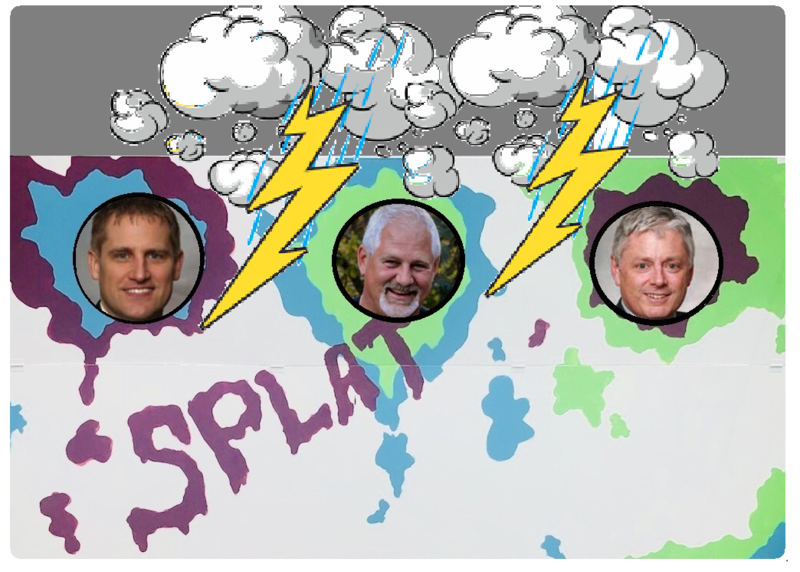 Unfortunately, the rain prevented us from throwing pies at Mark Thoma, Tom Conry, and Dave Duncan. But don’t rest easy yet, Gentleman – We are scheduling a raincheck! The TelePAC Pie Throwing Fundraiser will proceed. So, those of you who purchased raffle tickets for an opportunity to throw pies at these guys, rest assured you will get your chance! We will notify you as soon as we schedule an adequate alternative venue and date. Those who purchased tickets, you do not need to keep your ticket stub for the chance to throw pies. We have a record of all contributor names and contribution amounts and will create a name drawing based on that data. Stayed tuned … WE WILL PIE THESE GUYS! On June 6, the FCC issued an Order granting an extension of the filing deadline for the annual FCC Form 481 until July 16. The FCC is awaiting approval of the most recent modifications to Form 481 from the Office of Management and Budget (OMB). This extension does not extend to the requirement that all ILEC recipients of high-cost support report “all of their rates for residential local service for all portions of their service area … to the extent the sum of those rates and fees are below the rate floor… and the number of lines for each rate specified.” Affected ETCs filed such rates last year on the Rate Floor Form and should do so again by July 2, 2018. Current rules continue to require ETCs to file Form 481 with the IUB on July 1st or the date required by the FCC (which for 2018 will be July 16th.) The Alliance has filed a request that IUB waive this rule and not require Iowa ETCs to file their Form 481 with the IUB due to recent FCC pronouncements that the form 481 no longer need be filed with the FCC and state commissions. During the Chapter 39 ETC rulemaking hearing this week (see the next story), the Consumer Advocate objected to ICA’s waiver request, saying it needed access to Form 481, and it was unclear whether the new USAC portal would grant the OCA that access. OCA pointed out that it currently has access to all Form 481 filings through the IUB including the information filed confidentially. IUB announced that it would contact the FCC to determine how to grant OCA that access. The parties agreed that if OCA can access the USAC portal, then ETCs should not have to file the Form 481 with the IUB. The FCC issued a Public Notice this week providing guidance regarding the process for ETCs who wish to elect USAC to perform Lifeline recertification for their subscribers in 2019. All ETCs interested in having USAC perform the recertification process on their behalf, including those that have previously elected to use USAC for recertification, must notify USAC by August 31, 2018. ETCs that do not make an election by August 31, 2018 will be responsible for conducting recertification of their subscribers. For the 2019 recertification process, ETCs will perform their elections via an online form. USAC will recertify subscribers via mail. USAC will use NLAD to determine subscriber anniversary dates and retrieve the necessary subscriber information to facilitate the recertification process no earlier than 150 days before a subscriber’s anniversary date. Starting with the 2019 recertification period, USAC no longer will be manually processing, compiling, and sending results to ETCs. Instead, it will update NLAD with the results of the recertification, including all information required for ETCs to complete the FCC Form 555. USAC will automatically de-enroll from NLAD subscribers who do not recertify within five business days after the end of the 60-day recertification window. Within that five-day window, USAC will provide notice to those subscribers, informing them that they have been de-enrolled from their Lifeline benefit due to a failure to recertify their eligibility and steps that the consumer can take to re-enroll if they remain eligible. Click here for more information from the FCC Notice. Alliance General Counsel John Pietila spoke on behalf of most ETCs in Iowa during the IUB public hearing on Wednesday to receive comments on proposed changes to Chapter 39 ETC rules and to discuss the proper scope of ETC filings. Click here to read the IUB’s March 27th Order Commencing Rulemaking, and click here to read the Alliance’s comments. Pietila urged the IUB to not impose substantial additional requirements and filings over those required by the FCC, and to restrict itself to a monitoring function instead of a regulatory function over ETC filings. During the hearing, the OCA objected to the Alliance’s proposed amendment to simplify the ETC transfer rules between affiliated companies and OCA objected to the Alliance’s request to shorten the timeframes for IUB and OCA review of ETC transfers and relinquishments. In addition, after discussion of the OCA suggestion that the IUB include “broadband” as a service which the IUB can inquire of from ETCs, the parties agreed to such an amendment. The IUB is expected to finalize its rules in the next several weeks. Many Alliance members received an email from IUB’s Don Tormey scheduling an industry-wide workshop on Wednesday June 20th at the IUB. That workshop invited all interested parties to review all filings of any type, to discuss how to eliminate unnecessary filings and to determine all procedures for such filings that remain. Because of the extremely short notice for such a workshop (and of course the timing of the ICA Golf & Grill Classic), the Alliance asked the IUB to reschedule that workshop to a later date so that our industry can adequately prepare. IUB later advised that the workshop will be rescheduled, and we will give members plenty of notice of the new date and time. The Iowa Telecommunications & Technology Commission (ITTC) is seeking to fill the vacancy for a fifth commissioner. Due to rules that require gender and party balance on the Commission, the commissioner must be a woman that is either republican or independent. There are no geographic restrictions. The ITTC has the sole authority to supervise the management, development, and operation of the ICN. The Commission's duty is to ensure that the Network operates in an efficient and responsible manner. Click here to view existing the four members that make up the Commission, and two ex-officio members. If you, or someone you know, is interested in joining the ITTC, please contact Caitlin Jarzen for information on how to apply. 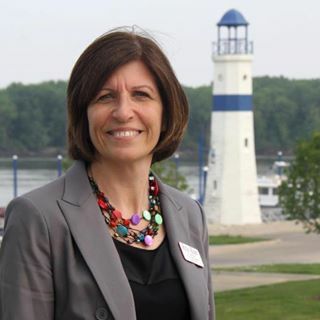 Fred Hubbell, 67, a retired Des Moines businessman, chose Rita Hart, 62, a farmer and educator from Wheatland, a Clinton County community of less than 800 people, to be his lieutenant governor candidate. Sen. Hart represents Clinton County and the northern and eastern part of Scott County. Last session, Sen. Hart was one of the Senate Democrats that voted in favor of the Alliance’s Telco Property Tax bill. Click here to listen to Sen. Hart speak on the Senate floor in support of telco property tax reform and rural broadband expansion. 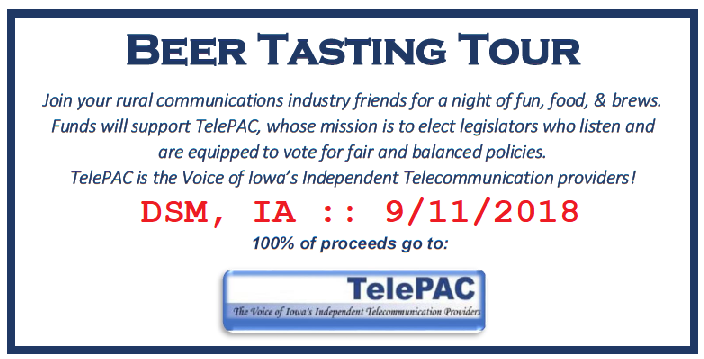 TelePAC 2018 Brew Tasting Tour: There will still be BUS, BREWS, & BITES + FRIENDS, FUN, & FUNDS – but this year – there will be all new Brew Tour locations! New brewery locations to be announced soon! Stay tuned for more details on this event, which will be held in conjunction with our Convergence TV (Video) Conference, September 11 - 12. Calix ConneXions is where industry thought leaders come to debate, collaborate, and learn how winning service providers are innovating to transform their business models. Join 2000+ telecommunications industry professionals, October 27-30 at the Wynn Las Vegas. Register early to lock in early bird rates! Legislation has been introduced in the US House and Senate to ensure that government money targeted to subsidize rural broadband will not be used to overbuild existing service. The Reprioritizing Unserved Rural Areas and Locations (RURAL) for Broadband Act of 2018 has been introduced in the House by Rep. Kevin Cramer (R-N.D.) and the Senate by Sen. Steve Daines (R-Mont.). Similar legislation was added to the Farm Bill during last week’s Senate Agriculture Committee meeting. The proposals are supported by NTCA, ITTA, USTelecom, ACA, NCTA and others. Current RUS rules allow an applicant to receive funds if as little as 15% of the service area is “unserved” while congressional efforts seek to raise that to 90% unserved. Click here to read more from Broadcasting & Cable. As part of the President’s regulatory reform initiative, the US Small Business Administration (SBA) has hosted over 25 roundtables in 14 states meeting with small businesses to identify their unique regulatory concerns. The SBA Office of Advocacy will continue that by hosting next month’s series of small business regulatory reform roundtables in Iowa on July 17 to 19. This is a great opportunity for member companies and their local small business owners to meet in-person with Advocacy senior staff. Please click here for dates and locations and feel free to share with interested clients, members and small business stakeholders. Thanks to NTCA for working with SBA and sharing this information. 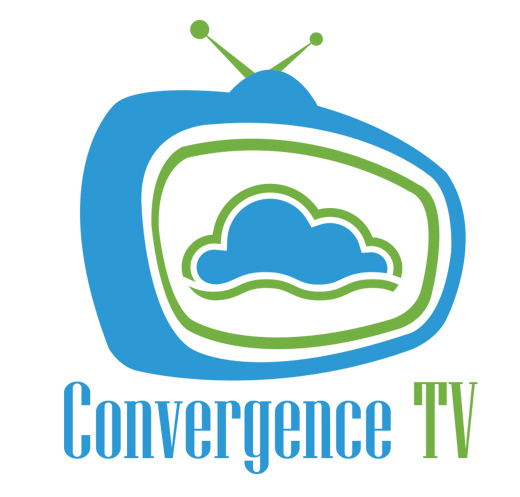 Mark your calendars for September 11th & 12th for our Convergence TV Conference. We will host sponsored User Group meeting on the afternoon of Tuesday, September 11th, and the main conference will be held on Wednesday, September 12th at the West Des Moines Marriott. If you’re needing a hotel room, there is a block of rooms reserved at the West Des Moines Marriott. Please call (515) 267-1500 and mention the ICA Conference when booking your hotel room. Think you know someone who’d be a fantastic speaker for one or multiple topics? AWESOME! We’d love to hear more about them. Click here if you have a speaker suggestion and our advisory committee will review. 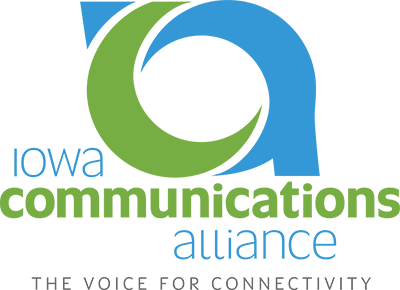 Comments on "Iowa Communicator - June 22, 2018"